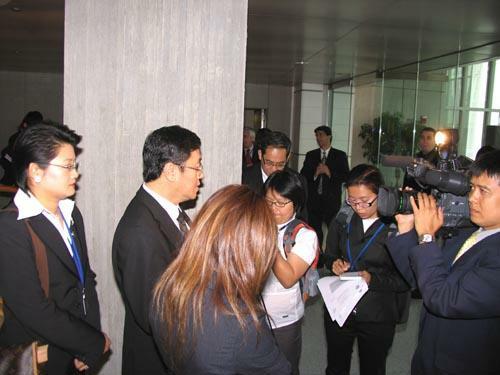 Mr. Surapong Suebwonglee, the deputy Prime Minister and Finance Minister, gave a special interview to Thai?? ?s news reporters on the result of the 77th World Bank Annual Meeting in which he summarized that, at the meeting, there were concern over the food price due to the popularity of growing crops used for producing alternative energy. However, he believed that it would be a good opportunity for Thailand to grow and develop the economy because Thailand was rich in natural resources and expertise as ?? ?the Kitchen of the World? ?� while their economic fundamentals were still good, at Washington, DC, United States of America (USA), April 13 2008.